Abdelmohsen, S.M., et al. Current Trend in the Management of Huge Recurrent Inguinal Hernia in Infants, a Case Series (2017) J Palliat Care Pediatr 2(2): 66-71. © 2017 Abdelmohsen, S.M. This is an Open access article distributed under the terms of Creative Commons Attribution 4.0 International License. The most common hernia repairs performed today in the pediatric population are for an inguinal hernia. The incidence of hernia recurrence of children is 1%. The use of prosthetic cone mesh for repair of a huge recurrent congenital inguinal hernia in infants is still rare. Also, laparoscopic intervention in pediatric necessitates available equipment and well-trained staff. 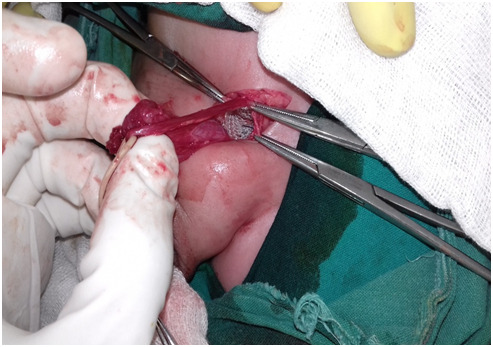 Here we focus on the ability to use a cone mesh plug for the large internal ring in male infants with recurrent huge congenital inguinal hernia without opening of the inguinal canal. The study included 8 boys with a recurrent huge congenital inguinal hernia, their ages ranged from 2 months to 2 years. The inclusion criteria are any infant with a recurrent large indirect hernia as having disrupted internal ring that is > 3 cm or two finger breadths in width (the tip of the little finger) according to the European Hernia Society (EHS) classification of groin hernia, plus he has a long sac with inguinoscrotal’s presentation. Partial exposure to the large internal ring without opening of the inguinal canal by the assist of mini retractor through the external ring, the mesh plug was inserted to occlude the defect for recurrent huge cases. The mean follow-up period was 2 months. The application of mesh plug technique in the repair of difficult cases of recurrent indirect inguinal hernia in boys is easily applicable, safe and not expensive. Some surgeon[3,4] applied the mesh plug by opening the inguinal canal. We find that in male infants no need for opening the inguinal canal to avoid more iatrogenic weakness for the groin, as external ring allows partial exposure to the internal ring by the assist of a mini retractor. A cone mesh plug technique can be applied easily and safely for male infants with recurrent huge congenital inguinal hernia without the need to opening the inguinal canal. An operation for a groin hernia is one of the most commonly performed general surgical procedures in both children and adults[5-7]. An Inguinal Hernia (IH) in children is a congenital lesion resulting from a persistent Patent Processus Vaginalis (PPV). The reported incidence of an inguinal hernia varies from 3% to 5% in full-term newborns, 13% among newborns born of less than 33 weeks of gestational age, and 30% of infants of less than 1000 g birth weight. A number of associated disorders including undescended testis, cystic fibrosis, bladder exstrophy, increased abdominal pressure (meconium ileus, necrotizing enterocolitis gastroschisis/omphalocele), increased peritoneal fluid (ascites, peritoneal dialysis and the presence of a ventriculoperitoneal shunt) and connective tissue disorders (Ehlers-Danlos syndrome, Hunter-Hurler syndrome, Marfan syndrome and mucopolysaccharidosis) may contribute in the presence of an inguinal hernia. Zollinger et al. defined the large indirect hernia as having disrupted internal ring that is greater than 4 cm or two finger breadths in width, plus it has a long sac with inguinoscrotal’s presentation. The European Hernia Society (EHS) proposed the tip of the index finger as the reference for the size of the internal inguinal ring in open surgery since the usual size of the tip of the index finger is mostly around 1.5 cm. Table 1: The European Hernia Society (EHS) groin hernia classification. An inguinal hernia repair is associated with operative complications, including hernia recurrence, vas deferens injury, and testicular atrophy, the rates of which vary from 1% to 8%[14-17]. Long-term complications include chronic pain and infertility in adulthood. Most recurrent congenital hernias are indirect and probably result from tearing off a friable sac, slipping off the ligature at the neck of the sac or failure to ligate the sac high at the internal ring. Laparoscopic intervention in pediatric necessitates available equipment and well-trained staff. Mesh-plug hernioplasty was first introduced into the 1970s and then promoted as a repair for all varieties of inguinal hernias in the 1990s[20,21]. Rutkow and Robbins have reported the short and long-term safety and efficacy of the traditional mesh-plug hernioplasty. This randomized control trial study was carried out at the pediatric surgery unit, surgical department, Assiut and Aswan University Hospital, Egypt, during the period from October 2016 to March 2017. The study included 8 boys with a recurrent huge congenital inguinal hernia, their ages ranged from 2 months to 2 years. The inclusion criteria are any infant with recurrent large indirect hernia as having disrupted internal ring that is >3 cm or two finger breadths in width (the tip of the little finger) according to European Hernia Society (EHS) classification of a groin hernia, plus he has a long sac with inguinoscrotal’s presentation. A written consent was taken from the parents after given them information about the operative procedure and its hazards. All operative interventions did by an experienced pediatric surgeon. A small piece of prolene mesh (1 cm x 2 cm) was designed to form a small cone with obliterated tip (Figure 1) and prepared to be used as a plug to obliterate the internal inguinal ring. The skin incision was planned to include the previous scar, the cord structures were identified an inferior to the external ring. The indirect sac was freed as possible from the cord structure then twisted and ligated at the neck of the sac. The cord displaced upward and laterally, through the external ring using small mini retractor, so partial exposure of the large internal ring without opening of the inguinal canal, the mesh plug was inserted to occlude the defect. The plug was secured with 2 - 3 interrupted prolene stitches into the edges of the internal ring to eliminate the possibility of plug migration in the inguinal canal. After good haemostasis the testis was pulled down in the scrotum and the wound was closed in layers. Figure 1: Prolene cone mesh plug. Postoperatively the infant was taken paracetamol rectal suppository6hrs; (amoxicillin and clavulanate) syrup8hrs, antiedematous syrup Amylase Alpha (maxilase)8hrs. The infant discharged at the 2nd postoperative days, the first follow-up check were performed one week after operation in the outpatient clinic of Assiut and Aswan University Hospitals, Stitches removed at the 10th postoperative days, and follow up continue every week for one month postoperative to detect postoperative complication like scrotal oedema, hydroceles, hernia recurrence, mesh infection, foreign body reaction, sinus tracts, changes in the size of the testis and mesh migration. The average duration of follow-up was 2 months. A total of 8 boys from Upper Egypt, with a recurrent huge congenital inguinal hernia operated by an experienced pediatric surgeon, their ages ranged from 2 months to 2 years, mean age (11 months), 2 cases of these 8 cases have hydrocephalus with Ventriculoperitoneal (VP) shunt. All boys had large internal inguinal rings. Operative time ranged from 25 - 30 minutes. The procedures were easy and smooth; our junior physicians learned the procedures easily. Figure 2: Exposure of a large internal ring by using miniretractor through an external ring. Figure 3: Exposure a large internal ring. Figure 4: A cone mesh plug inside a large internal ring. Figure 5: After fixation of the mesh inside the internal ring. Figure 6: 1st postoperative week follow up, no postoperative oedema or hydrocele. 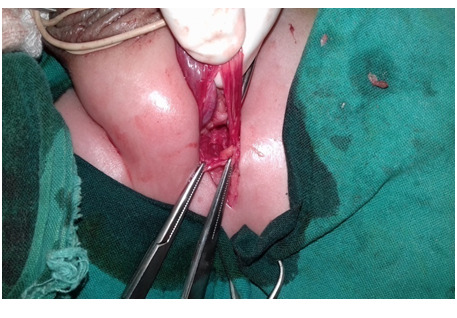 Figure 7: 3rd months postoperative for another case with redundant scrotal skin and congenital hypomelanosis. Infants with large hernias present a challenge to the pediatric surgeon. As there is scant literature regarding these hernias in children, their management may be challenging. Repairing giant hernias using conventional methods is associated with a high recurrence rate. The recurrence was reported to be 0.68 – 4% in different studies[24-27]. The definitive reason for recurrence after inguinal hernia surgery still remains unclear and it has not been possible to identify single parameters or risk factors as being responsible. The identified risk factors of recurrence range widely and include controllable technical risk factors such as surgical technical methods[28,29], methods of anesthesia, surgeon experience. Furthermore, a wide range of uncontrollable patient-related risked factors such as growth failure, prematurity, malnutrition, bladder exstrophy, cryptorchidism, and seizure disorders with spasticity. Grasfeld et al. suggest that certain potentially predisposing factors played a role in the recurrences. The first factor was improper ligation of the sac at the internal ring and the second one was the presence of a large internal inguinal ring (type 2 and 3) according to EHS classification of a groin hernia but we think that this hernia classification and estimation of the size of internal ring is underestimated in pediatrics as it is specific for adult population and we need more future researchers for more specific groin hernia classification in pediatrics. The other factors that Grasfeld et al. studied that proved important to recurrence were inheritance weakness or fragility of tissues in patients with connective tissue disorders or conditions associated with increased intra-abdominal pressure such as VP shunt, ascites, posterior urethral valve, weight lifting, and pulmonary diseases causing chronic cough. Adequate high ligation at the internal ring, snuggling of a large internal ring, avoidance of injury to the canal floor, and closure of the internal ring in girls are important operative considerations in preventing indirect hernia recurrence. Selected patients with connective tissue disorders, poor nutrition, and increased intra abdominal pressure (ascites, VP shunts) associated with weak floor tissues should undergo iliopubic tract repairs to prevent recurrence. The preperitoneal repair is advantageous to patients with multiple recurrences. Huge and recurrent hernias, however, usually allow time for adequate surgical preparation. These hernias are also amenable to modern prosthetic repairs. The use of mesh during laparoscopic hernia repairs is associated with a reduction in the risk of hernia recurrence incomparison with non-mesh methods of hernia repair. However, there is no apparent difference when laparoscopic methods are compared with open mesh methods of hernia repair. The data available show less persisting pain and numbness following a laparoscopic repair and return to usual activities is faster. However, the laparoscopic approach is abandoned by some author’s especially in boys also; it necessitates available equipment and well-trained staff. We do not have pediatric laparoscopic equipment at Aswan University Hospital due to poor resources of our hospital. 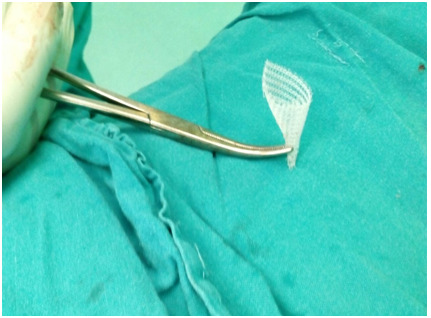 The application of mesh plug technique in the repair of difficult cases of recurrent indirect inguinal hernia in boys is easily applicable, safe and not expensive. There was any need for high ligation of the sac or repair of the disturbed anatomy of the inguinal region thus avoiding damage to the cord structures or the floor of the inguinal region. 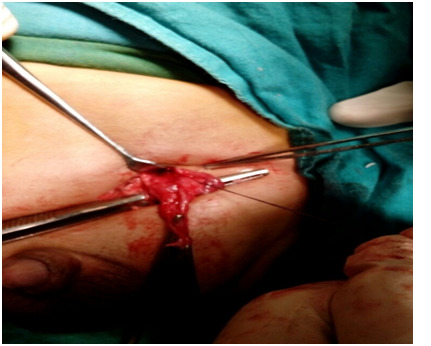 Some surgeons[3,4] applied the mesh plug by opening the inguinal canal. We find that in male infant no need for opening the inguinal canal in the presence of large internal ring to avoid more iatrogenic weakness for the groin and more disturbances to the anatomy of the inguinal region, as external ring allows partial exposure to the internal ring in infants by the assist of mini retractor. The presence of a normal vermiform appendix in an inguinal hernia sac is uncommon, with a reported incidence of 0.6 to 1 % of inguinal hernias[34,35]. It has generally been associated with large indirect inguinoscrotal hernias. Amyand’s hernia predominantly occurs on the right side. This is probably because right-sided inguinal hernias are more common than left-sided hernias, and the appendix is normally found on the right side and exceptionally on the left side due to situs inversus. Regarding appendectomy, the indications for the procedure in cases of Amyand’s hernia depends on the mode of presentation. In cases involving patients with normal appendices, appendectomy is not necessary. On the other hand, appendectomy is required in cases involving acute appendicitis. Acute appendicitis within an inguinal hernia accounts for 0.1 % of all cases. The presence of pus and perforation of the appendix are absolute contraindications for mesh-based hernia repair procedures. Whether to remove or leave behind a non-inflamed appendix is confusing. The patient’s age, the size of the appendix, life expectancy, and lifelong risk of developing acute appendicitis influence the surgeon’s decision of performing appendicectomy. If one plans to do appendicectomy for a normal appendix, then there are chances of infection to an otherwise clean surgery so, it is ideal to replace the normal-looking appendix and do hernioplasty. Those in favor of appendicectomy, however, feel that surgical handling will traumatize the appendix partially. So, it is better to deal with appendicectomy with outmost care taken to prevent contamination. As younger patients have a higher risk of developing acute appendicitis at a later age, an appendectomy may be considered, whereas, in elderly individuals, the appendix may be left intact. So, it is a surgical dilemma for the surgeon to decide whether to save or remove a normal-looking appendix which might have become traumatized while handling and may present as appendicitis in the postoperative period or we unnecessarily remove a normal appendix and open the gut and thus increase the chances of wound infection. We remove the appendix to one of our case of recurrent giant right inguinal hernia as it was looking absolutely normal and also we were very gentle while handling and removing the appendix to avoid contamination also, we made a mesh plug technique successfully without any postoperative complication. Finally, we are preparing for a prospective study about mesh plug technique in a pediatric population with long term follow up to detect a delayed postoperative complication as mesh migration and foreign body reaction. To prevent recurrence in case of huge congenital inguinal hernia in male infants with a large internal ring, for a hernia operated on the first time snuggling of a large internal ring by partial exposure to external ring can be done without the need to opening the inguinal canal. If a hernia is recurrent a cone mesh can be applied easily and fixed to a large internal ring by 2 - 3 stitches without the need to opening the inguinal canal to prevent more weakness and more disturbances to the anatomy of the inguinal region. To my brother, Basel Magdy Abdelmohsen for language checker and to my colleagues, Dr. Ahmed Gamal Abdelmalek assistant lecturer of pediatric surgery Assiut university hospital, who helped me by taken intraoperative photography. No funding has been used for this research. No ethical approval has been applied for this case series study, only the written and oral consent by the relatives of the patients. A written consent has been obtained from the patient’s relatives for operative intervention and for the publication of this case series and accompanying images and is available for review on request. Sarah Magdy Abdelmohsen, pediatric surgery, Aswan University hospital, Egypt. She was the operator and responsible for the Study design, data collection, interpretation and writing of the paper. Mohamed Abdelkader Osman, Headmaster of pediatric surgery, Assiut University hospital, Egypt. He was operator, supervisor, reviewer and observational. 1. Moss, R.L., Hatch, E.I.Jr. Inguinal hernia repair in early infancy. (1991) Am J Surg 161(5): 596-599. 2. We do not have pediatric laparoscopic equipment at Aswan University Hospital due to poor resources of our hospital. 3. Shreef, K.S. Application of Mesh Plug Technique in the Repair of Difficult Cases of Recurrent Indirect Inguinal Hernia in Boys. (2010) Annals Pediatr Surg 6: 14-17. 4. Soto, L., Saltzman, D. The Use of Prosthetic Mesh for the Pediatric Hernia Repair. (2004) In: Schumpelick, V., Nyhus, L.M. (eds) Meshes: Benefits and Risks. Springer. 5. Everhart, J.E. Abdominal wall hernia. (2008) In: Everhart, J.E. editor. The burden of digestive diseases in the United States. US Department of Health and Human Services, Public Health Service, NIS National Institute of Diabetes and Digestive and Kidney Diseases. 93-95. 6. Rutkow, I.M. Demographic and socioeconomic aspects of hernia repair in the United States in 2003. (2003) Surg Clin North Am 83(5): 1045-1051. 7. Ein, S.H., Njere, I., Ein, A. Six thousand three hundred sixty-one pediatric inguinal hernias: a 35-year review. (2006) J Pediatr Surg 41(5): 980-986. 8. Chan, K.L., Tam, K.H. Technical Refinements in Laparoscopic Repair of Childhood Inguinal Hernia. (2004) Surg Endosc 18(6): 957-960. 9. Grosfeld, J.L. Current Concepts in an Inguinal Hernia in Infants and Children. (1989) World J Surg 13(5): 506-515. 10. Peevy, K.J., Speed, F.A., Hoff, C.J. Epidemiology of Inguinal Hernia in Preterm Neonates. (1986) Pediatrics 77(2): 246-247. 11. Glick, L.P., Boulanger, S.C. Inguinal Hernias and Hydroceles. In: Grosfeld, L.G., O’Neil Jr., J.A., Fonkalsrud, E.W., Coran, A.G. Eds. (2006) Pediatr Surg 1172-1192. 12. Zollinger, R.M.Jr. Classification of ventral and groin hernias. (2002) In: Fitzgibbons, R.J.Jr., Greenburg, A.G., editors. Nyhus and Condon’s hernia. 5th edition. Philadelphia: Lippincott Williams & Wilkins 71-79. 13. Miserez, M., Alexandre, J.H., Campanelli, G., et al. 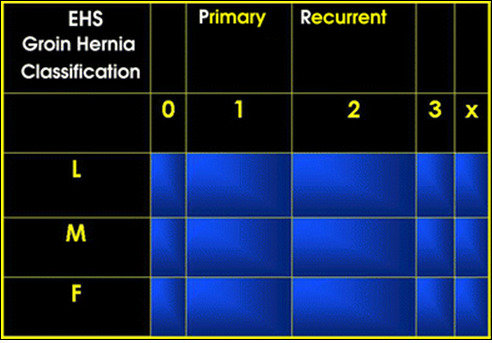 The European hernia society groin hernia classification: simple and easy to remember. (2007) Hernia 11(2): 113-116. 14. Ein, S.H., Njere, I., Ein, A. Six thousand three hundred sixty-one pediatric inguinal hernias: a 35-year review. (2006) J Pediatr Surg 41(5): 980-986. 15. Skinner, M.A., Grosfeld, J.L. Inguinal and umbilical hernia repair in infants and children. (1993) Surg Clin North Am 73(3): 439-449. 16. Harvey, M.H., Johnstone, M.J., Fossard, D.P. Inguinal herniotomy in children: a five-year survey. (1985) Br J Surg 72(6): 485-487. 17. Hecker, W.C., Ring-Mrozik, E. Results of follow-up of operations in pediatric patients with indirect inguinal hernia [in German]. (1987) Langenbecks Arch Chir 371(2): 115-121. 18. Zendejas, B., Zarroug, A.E., Erben, Y.M, et al. Impact of childhood inguinal hernia repair in adulthood: 50 years of follow-up. (2010) J Am Coll Surg 211(6): 762-768. 19. Fette, A.M., Hollwarth, M.E. Special aspects of neonatal inguinal hernia and herniotomy. (2001) Hernia 5(2): 92-96. 20. Rutkow, I.M., Robbins, A.W. “Tension-free” inguinal herniorrhaphy: a preliminary report on the “mesh-plug” technique. (1993) Surgery 114(1): 3-8. 21. Lichtenstein, I.L., Shore, J.M. Simplified repair of femoral and recurrent inguinal hernias by a “plug” technique. (1974) Am J Surg 128(3): 439-440. 22. Robbins, A.W., Rutkow, I.M. Mesh plug repair and groin hernia surgery. (1998) Surg Clin North Am 78: 1007-1024. 23. Stoppa, R.E. The treatment of complicated groin and incisional hernias. (1989) World J Surg 13(5): 545-554. 24. Vibits, H., Pahle, E. Recurrences after inguinal herniotomy in children. Long time follow-up. (1992) Ann Chir Gynaecol 81(3): 300-302. 25. Fung, A., Barsoum, G., Bentley, T.M., et al. 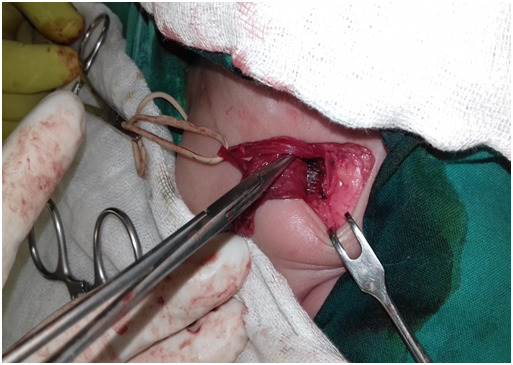 Inguinal herniotomy in young infants. (1992) Br J Surg 79(10): 1071-1072. 26. Wright, J.E. Recurrent inguinal hernia in infancy and childhood. (1994) Pediat Surg Int 9(3): 164-166. 27. Steinau, G., Treutner, K.H., Feeken, G., et al. Recurrent inguinal hernias in infants and children. (1995) World J Surg 19(2): 303-306. 28. Schmedt, C.G., Sauerland, S., Bittner, R. Comparison of endoscopic procedures vs Lichtenstein and other open mesh techniques for inguinal hernia repair: a meta-analysis of randomized controlled trials. (2005) Surg Endosc 19(2): 188-99. 29. Zhong, C., Wu, B., Yang, Z., et al. A meta-analysis comparing lightweight meshes with heavyweight meshes in Lichtenstein inguinal hernia repair. (2013) Surg Innov 20(1): 24-31. 30. Kehlet, H., Bay-Nielsen, M. Local anesthesia as a risk factor for recurrence after groin hernia repair. (2008) Hernia 12: 507-509. 31. Neumayer, L.A., Gawande, A.A., Wang, J., et al. Proficiency of surgeons in inguinal hernia repair: effect of experience and age. (2005) Ann Surg 242(3): 344-352. 32. Grosfeld, J., Minnick, K., Shedd, F., et al. Inguinal hernia in children: factors affecting recurrence in 62 cases. (1991) J Pediatr Surg 26(3): 283-287. 33. McCormack, K., Scott, N.W., Go, P.M., et al. Laparoscopic techniques versus open techniques for inguinal hernia repair. (2003) Cochrane Database Syst Rev. 34. D’Alia, C., Lo Schiavo, M.G., Tonante, A., et al. Amyand’s hernia: case report and review of the literature. (2003) Hernia 7(2): 89-91. 35. Thomas, W.E., Vowles, K.D., Williamson, R.C. Appendicitis in external herniae. (1982) Ann R Coll Surg Engl 64(2): 121-122. 36. Pellegrino, J.M., Feldman, S.D. Case report: acute appendicitis in an inguinal hernia. (1992) N J Med 89(3): 225-226. 37. Solecki, R., Matyja, A., Milanowski, W. Amyand’s hernia: a report of two cases. (2003) Hernia 7(1): 50-51. 38. Franko, J., Raftopouls, I., Sulkowski, R. A rare variation of Amyand's hernia. (2002) Am J Gastroenterol 97(10): 2684-2685. 39. Gurer, A., Ozdogan, M., Ozlem, N., et al. Uncommon content in groin hernia sac. (2006) Hernia 10(2): 152–155. 40. 40. Hutchinson, R. Amyand's hernia. (1993) J R Soc Med 86(2): 104-105.